Rare no reserve luxury auction of this affluent Phoenix suburb home will be sold regardless of price on May 26th, 2016. 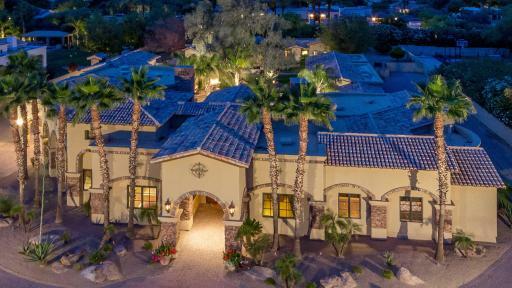 (Paradise Valley, AZ) Supreme Auctions will offer Bluebird Paradise, an elegant Spanish-Mediterranean estate in Paradise Valley, Arizona to the market at a luxury absolute auction in cooperation with Christina Catalano of Ventana Fine Properties, Angels RE Group. This auction comes on the heels of the record-breaking pre-auction sale of the March 3rd Hawks Nest property in Carefree, AZ. Supreme Auctions sales are known for attracting both national and international buyers with a quick closing process—often within 30 days or fewer of the auction. Bluebird Paradise was designed and built by Cameron Builder and offers buyers the chance to own property in one of Greater Phoenix’s most coveted and affluent towns, Paradise Valley. The estate itself is a private enclave with a spacious main house, a completely separate secluded second house, a 6–car garage, sport court and elegant resort-style courtyard and grounds that offer complete privacy for outdoor living. Fine details like a Juliet balcony, vaulted ceilings, natural hardwood floors, and faux finishes throughout give the estate a refined feel. The luxurious master suite boasts a hand-carved Cantera fireplace as well as a second fireplace in the master bathroom. From the custom cabinetry in the kitchen, to a true wine cellar at the base of a spiral staircase, to a rich-wood library, exquisite qualities are seen throughout the home. A secondary house accommodates not one but two en-suite master bedrooms, as well as a separate living room, dining room, kitchen, and laundry room, attached to a two-car garage. Its own entrance and patio ensure complete privacy for family, friends, or a lease opportunity. The city of Paradise Valley offers resort-style amenities like world-class golfing and boutique shopping. Nearby Scottsdale is home to the world-renowned Mayo Clinic, and offers top resorts and spas, and Westworld, a nationally recognized equestrian center and home to the annual Barrett Jackson Collector Car Auction. Bluebird Paradise is also just 15 minutes from downtown Phoenix, home to numerous Fortune 500 company headquarters, the Arizona state capital, and Sky Harbor International Airport. Phoenix is also the state’s cultural capital, the Southwest’s largest destination for visual art, and home to the Phoenix Symphony Hall, Phoenix Opera, Talking Stick Resort Arena, Chase Field and the Orpheum Theatre. Parties interested in the luxury no reserve absolute auction of Bluebird Paradise, or any other Supreme Auctions property, can contact Supreme Auctions directly at (866) 929-2243 or visit www.supreme-auctions.com for complete auction details and information.